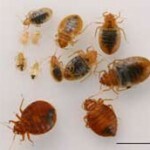 Bed bugs produce 2 to 3 eggs per day, each female can produce 400 – 500 eggs during her lifetime. Bed bugs exhibit incomplete or gradual metamorphosis, from egg, through 5 nymphal stages, to adult. The time it takes any particular bed bug nymph to develop depends on the ambient temperature and the presence of a host. Under favorable conditions, such as a typical indoor room temperature (>70° F), most nymphs will develop to the next instar within 5 days of taking a blood meal. If the newly molted instar is able to take a blood meal within the first 24 hours of molting, it will remain in that instar for 5-8 days before molting again. At lower temperatures (50° F – 60° F), a particular instar may take two or three days longer to molt to the next life stage than a nymph living at room temperature. However, if a bed bug nymph does not have access to a host, it will stay in that current instar until it is able to find a blood meal or it dies. The time for a bed bug to develop from an egg, through all five nymphal instars, and into a reproductive adult is approximately 37 days.